Springwall offers a wide range of clever storage options to maximize the space in your bedroom, as well as a wide selection of headboards to suit your style. Complete the look of your bed by selecting a fabric colour of your choice. Heavy duty solid timber platform base with standard castros setting and choice of designer cover. The designer base will be the complementary element of the bedroom with different options of colors and alternative headboards. 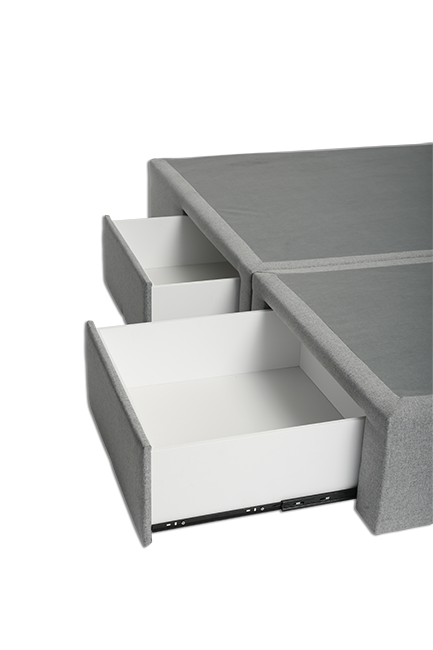 Manufactured with a variety of drawer configurations to provide under bed storage. The Base will change the atmosphere of your be droom with its contemporary style and high foot design, will be the irreplaceable piece of your decoration with its long-lasting construction. The High Profile brings elegance to bedrooms with various color alternatives, as well as making a statement in strength with a steel construction. High legs make it extremely easy to clean underneath.